Rancho Equestrian All Natural Products. Rancho Equestrian 'Night Garden Blend' is the 1st in our line of all natural, organic salves & soaps. Our products are made with pride in California of the best local, natural & organic ingredients. 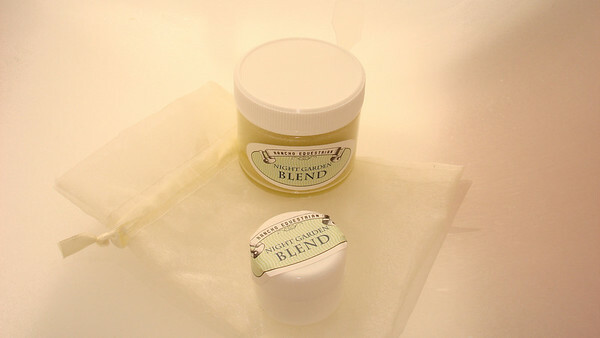 Night Garden Blend is a topical salve to be used at night after your usual facial cleanse. Our salve will promote healthy cell rejuvenation while you rest. It is also excellent for cuts & cuticle maintainance and for your horses little nicks & abrasions. 1st in Our Men's Line! 'Face To Face'. An after shave, daytime, nightime balm aimed at cell rejuvination while you enjoy life! Please contact us at RanchoEquestrian@gmail.com to order. Enjoy! Rancho Equestrian 'Night Garden Blend' is the 1st in our line of all natural, organic salves, soaps and candles. Our products are made with pride in California of the best local, natural, organic ingredients. 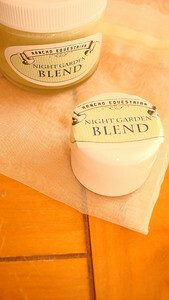 Night Garden Blend is a topical salve to be used at night after your usual facial cleanse. Our salves will promote healthy cell rejuvenation while you rest. It is also excellent for cuts, cuticle maintainance, and for your horses little nicks & abrasions. Please contact us at RanchoEquestrian@gmail.com to order. Enjoy!